“Life’s a riddle” croons the opening song of Buster’s Mal Heart. Hoo boy, it sure is. At the start, two shadowy figures sit in a small row boat on the open sea. Despite being the first image of writer/director Sarah Adina Smith’s existential delight, this scene is one of the final pieces of the puzzle she creates. Looking back, the plot is simple, in its bizarre sci-fi short story kind of way. But the resulting film is not simple. The order of events has been jumbled and small interactions are dragged out only to be pumped full of paranoia. Each moment of Smith’s film is tense, uncomfortable and absolutely lovely. The soundtrack is a character all its own, often transitioning between different covers of the same song as scenes change from one reality to the other. The camera constantly finds an interplay of light and dark, whether bare trees against a winter sky or a glowing TV in a dimly lit office. 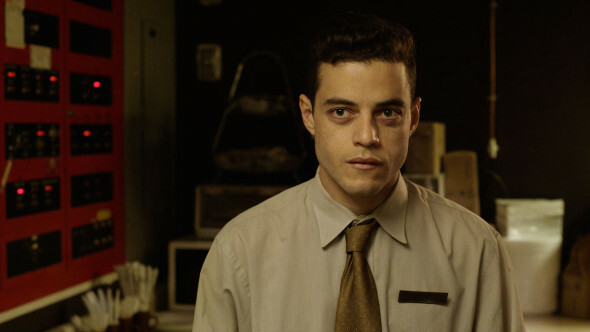 Buster’s Mal Heart contemplates the claustrophobia of working a dead-end job inside the machine of modern society, and Rami Malek (Mr. Robot) is the perfect canvas. You can see the quiet rage within him long before he lets it slip. He plays both cautious and wildly consumed by conspiracy with equal commitments. I would’ve watched him sit at his dingy concierge desk for the whole hour and a half. DJ Qualls (The Man in the High Castle) is not to go unmentioned either, as The Last Free Man. He delivers wild cosmic theories with enough sanity to make them sound almost plausible. And in Buster’s Mal Heart, almost plausible makes the leap to utterly real without breaking a sweat. This film begs to be consumed as a whole, a new rarity in our distracted age. There is no moment for you to sneak out for a bathroom break or check your texts. Even shots of Buster simply vacuuming the dining room somehow feel important and are key to mood that Smith has crafted. Imagine the universe. It is impossibly large. Infinitely large. We exist within the universe, and yet have only theories of how it works. Allow yourself to panic at this idea, to become uncomfortable. Allow your own smallness to make your heart race and your brain stutter. Think about the things you do, every day, that have no consequence at all on existence at large. Now, before you sprint headlong into the woods, go see this movie.